Genius Smart Keyboard is a customizable keyboard aims to raise input efficiency by 50% or more! In addition to standard multimedia, internet/social functions, it provides you the ability to replace tedious, repetitive typing or frequently performed tasks by a single keystroke! It does this by providing you the ability to customize the 12 function keys to assign your preferred shortcuts or predefined tedious keystroke sequence. 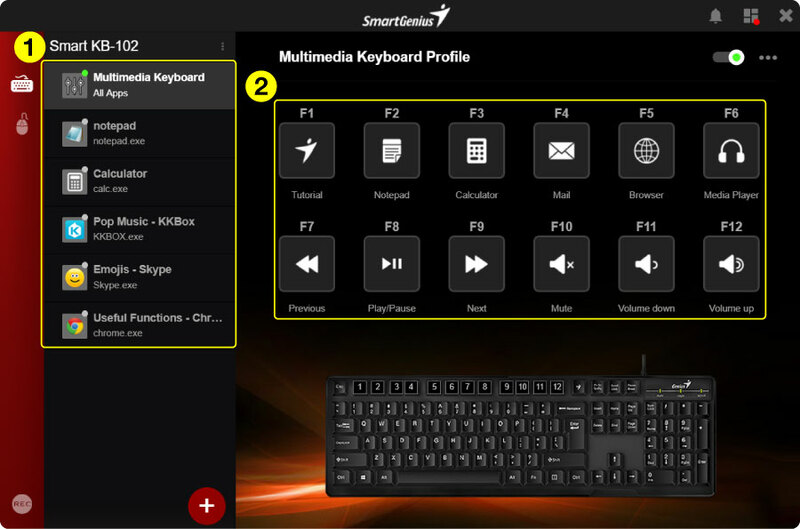 Together with the Genius smart engine, SmartGenius, which you just installed, you will immediate feel the boost of efficiency when the 12 function keys can be uniquely defined for each different application! 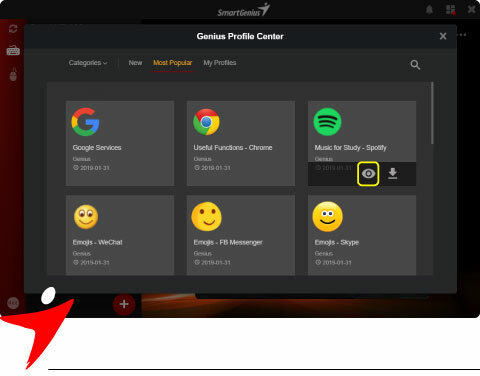 In this tutorial, we will show you a few basic steps on how to take advantage of Genius Smart Keyboard out of the box right away or personalize it in the way that you prefer it to be! As you have already experience, the Genius Key brings up a visual key panel to remind you the current function key mapping for the front running application or system environment if no application is identified. If you switch between applications where the application has its own function key definition profile, then you will observe the function key icon changes accordingly! 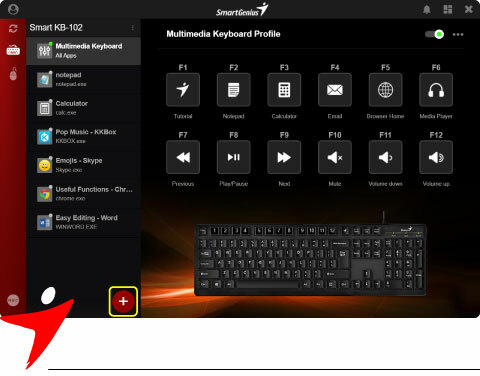 At the right corner, there is the “configuration icon” which you can click to activate the Genius Smart Keyboard configuration tool to be described below. 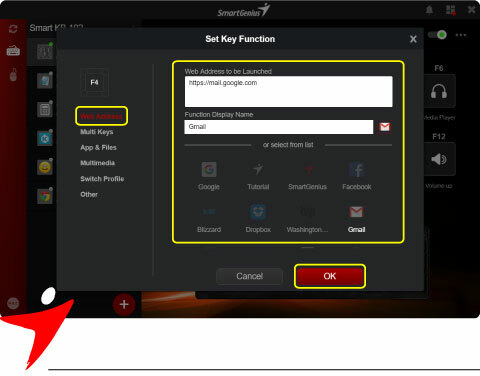 The smart function key setting will be saved as Profiles. The Multimedia Keyboard Profile is now in use. We will talk more about the Profiles in another tutorial. The icons here represent the current function of physical F1 – F12 keys. Customize multimedia keys the way you want them. 1. Go to the main page of SmartGenius. 2. Move the mouse to the F7 Previous icon. 3. Click and hold the F7 icon. 4. Drag it and release it on the F8 icon. Customize to have one key access my web based-email. You can replace the traditional email function (which opens the local email app) with the web-based email services. 1. Move the mouse to the Mail icon (F4). 3. The Set Key Function screen will be displayed. 4. Select the Web Access tab. Now you can click function key F4 and be connected to your favourite email account! More efficiency and fun boosters! Genius Smart Keyboard is more than just a customizable multimedia keyboard! Besides the examples we just talked about, the Smart Keyboard can also be used with other popular applications. Go to Genius Profile Center to find out how the Smart Keyboard improves the input efficiency of the applications you use. 2. Click Genius Profile Center. 3. 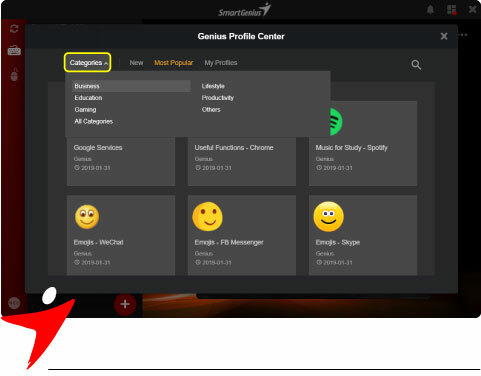 The Genius Profile Center will be displayed. 4. Check out the popular pre-defined settings (Profiles). 5. Go to the Categories tab to see the profiles from different categories like Business, Education, and Productivity etc. We just walked through the basic setting of the Genius Smart Keyboard. Explore SmartGenius version 1.6 to find out more and have fun!